I believe passionately in independent travel: making your own way, booking your own transport and generally doing whatever you feel like doing while on your trip. I’ve been doing this non-stop for over three years now as a writer and photographer and I can’t imagine traveling any other way. It’s easier to do than many think and –in my experience– the rewards far outweigh the hassles. This is the question to ask yourself — do you want to just want to see a place or do you want to experience it? if you just want to see it, a tour can be a great option (and in fairness, a 2-3 hour introductory tour of a city can be a very helpful way to get oriented and pick out spots that you’d like to visit the next day). If you want to experience a place, you’re not going to really do it with 30 other foreigners crowded around you. And many local people you meet in this situation are going to see one thing: your wallet. They know the routine better than you do: you’re here for 30-40 minutes of sight-seeing, a bland buffet lunch and then you’re back on the bus. No one is going to bother with introducing you to the their child so he or she can practice their English or share a cup of tea with you. There’s no time. No one in the market is going to bother haggling with you on price. If you won’t pay double the going rate, that nice couple behind you will. Or someone on the 2pm bus will — again, the vendors know the game inside and out. Oh, how I love those powered walkways. They let me zip through an airport like a superhero, but you know what? They pick me up and drop me off at the exact same place as everyone else. And that’s a great thing when I’m trying to catch my flight, but it’s not so fun once you reach your destination. Of course you want to see the Mona Lisa or the view from the Eiffel Tower — you’d be crazy not to. But I bet the best memory of your trip will be of that tiny out-of-the-way cafe you and your partner stumbled upon or any of a hundred other magical moments that wouldn’t have happened with a large entourage. Also, if you decided you like a spot, you can stay longer. Flexibility is key. “Look, honey, we can visit 5 cities for this great price! And everything is included!” And when tour operators say everything, they mean everything. To make the tour seem like a better value they often add extra stops, many of which you may or may not really care about. Several will be to markets or other shopping opportunities where the bus driver or the company gets a kick back from every dollar you spend. The driver isn’t taking you to that restaurant because it has great food. He’s stopping there because he or the boss has worked out a deal and it’s one of the few places that can handle so many people at once. You’ll find better food across the street at a stall for a fraction of the price. Local eateries depend on repeat business. The big tourist place doesn’t — they know they’ll never see you again so there’s no incentive to provide tasty, cheap or clean food. Don’t speak the language and don’t know what to order? Point at something that looks tasty and give it a try. I once took a half-day tour in Laos because I wanted to see a little-known historical site called The Plain of Jars. It really couldn’t be done solo so I signed onto a half-day tour that included a visit to 3 of the 13 known sites and a “bonus tour” of Whiskey Village, a town that is “famous” for brewing rice whiskey. Hey, maybe this tour idea isn’t so bad after all. Whiskey Village consisted of one toothless old man living in a hut on the side of the road. We all crowded into this tiny tin-roofed shed and the guide showed us plastic garbage cans full of fermenting rice. The old guy pulled out a very-recycled liter water bottle that was half-full and poured us each a big shot of rice whiskey. The woman next to me balked at hers so I took care of it as well as mine (I am a Southern gentleman, after all). The tour guide looked at us all, nodded and herded us back to the bus. So much for Whiskey Village. With so much relevant, timely information available online and with wifi being so prevalent through much of the world, finding and securing accommodation is easier than ever. Websites such as Tripadvisor.com and Airbnb.com allow you to preview photos of the hotel/rooms and get feedback from people who have stayed there. Some of these ‘reviews’ are less-than-true so certainly keep that in mind and check multiple sources. Also consider that the tour company is going to tell you what a great place you’ll be staying at as well. There are other great resources to ask fellow travelers for tips and up-to-date information: Bootsnall.com has an active and knowledgable forum. Travelfish.com is a fantastic source of information about Asia. Lonely Planet’s Thorn Tree forum an be incredibly useful (but search previous posts before asking a questions — they can be a cranky bunch). That said, one helpful member pointed me to a $7-per-night room in Antigua, Guatemala where the average going rate was $20 minimum. Take a photo of the town map from your guidebook and set it to “do not delete” on your camera or download one to your smartphone (this is your emergency backup). Then throw the guidebook under your bed, grab a business card from the hotel counter, walk out the door and pick a direction at random. Get lost. Get thoroughly lost. Meet people who don’t normally see tourists in their neighborhood. If you’re a single male, there’s a decent chance someone’s mother may try to marry you to their daughter. There’s an even better chance that you’ll soon have a train of kids following you and giggling. And always ask before taking photos of someone. When you’ve tired yourself out, wave down a taxi, pedi-cab, tuk-tuk or other form of local transportation, show them the business card and ride back to the hotel for a nap and a nice dinner at that place you spotted on the corner. I couldn’t agree with you more! The organised tours I’ve done have been the worst. I remember being ferried on and off the tour bus in Barcelona while with a friend who’s terrified of being abroad. We paid through the nose, were rushed constantly and I ate the worst Spanish food I’ve ever had. It’s so much better to explore independently. And if you want to learn about a place, I feel asking locals is the best. My brother and I was treated to a impromptu trip to a local temple and cave in Cambodia by a father and son just because we showed interest in learning about their culture; they actually wanted to show us around. One of my best experiences travelling, and it only cost us the dinner we bought them after! I agree with you completely. I went on a 10 day group tour to Israel once and I do not remember much from that trip. It was jam packed with stuff that were not important and just a waste of time. On all the trips I have planned on my own I remember almost every detail. Group tours are almost always more expensive that doing it on your own. Love the post. I am from South Africa, Cape Town and get many people asking about safety. And I know there’s a lot in the news but really. I live here and don’t want to go anywhere else. I know the place. Just the other day a couple walked from Cape Town to Cairo. I am sure no one will ask them what about your safety? So when I read about people travelling in busses I get the feeling they are scared. Why travel when you are scared or when you want to save money. Just watch the tell at home. This article is full of accurate insight and reasoned tips for people who want to step out of the tourist-herd and learn a new way of traveling. Great job Wes! Yea when I went to the grand canyon I made the mistake of taken a tour. We got on the bus and headed to where everyone was and a lot of fences and signs saying don’t do this don’t do that. It was still beautiful but I only got to spend about 2 hours there. I would of rather spent the entire day walking around and exploring. Wes, you are absolutely right. Guided tours are for squares! One thing to add, although this pertains more to “Westernized” cities such as Montreal, Boston, London, and Paris, is that new bike sharing programs allow tourists to pick up a cheaper, faster mode of transportation than either taking a tour bus or taking a subway. When you can grab a bike and get lost on the streets of a new city it really allows you to find all sorts of hidden gems, away from the tourists. Keep up your great work! I think you know that I agree with you Wes. Now if we could just get the other 20 million Americans to stop being afraid of independent travel….it’s one of my missions in life. Totally agree with you. Some of my biggest travel regrets have been going on bus tours/packaged vacations. They always feel rushed and like you said, you only get to see a place, not experience it. While travelling independently involves a little more planning and preparation, the freedom you have to travel more deeply is liberating. Let me be the first to disagree with you. I’ve done both independent travel and group tours over the last 3 decades and come to the conclusion that both can provide unique and wonderful ways to experience destinations and meet the locals. In fact, I get rather pissy with this conversation because I think travel of any kind is something to be thankful for, not condemned because it’s not done “my way”. Recently I experienced the best adventure I’ve had in a number of years… it happened to be while on a group coach tour in Italy. Both forms of travel have their pros and cons, but sometimes I just want to leave the details to somebody else and just show up, enjoy and learn. And, having a tour guide that knows the destination, is fluent in the language, understands the culture and can show you around like your best local buddy would is priceless! I think “being condemned” is a bit of over-reach on your part. If it works for you, go for it. And I even made reference that there were times when tours worked for me. But on the whole I think independent offers a richer, deeper experience and there is something every empowering about doing it yourself. And I heartily agree that travel is, indeed, something to be thankful for. Hi Wes, Maybe “condemned” was a tad harsh – wasn’t my intention to offend anyone (just lack of a better word at that moment). I’ve taken tours where they are as you describe – rushed, more time on a bus than at the destination, eat in the hotel with the masses of other tour passengers, arrived at the same spot as hundreds of others to view “the” historic/significant site of the day, etc… That’s no fun whatsoever! On the other hand, I’ve also taken tours where I’ve had a significantly richer and deeper experience with the locals than I could had I been travelling on my own – i.e. having lunch at the home of a family in Serbia and learning about their lives during and since the war; learning how to make fresh mozzarella from a mama in southern Italy at the family farm they have operated for 5 generations; going to the home of a Berber family in Morocco and they perform a traditional tea ceremony and bake fresh bread for us. 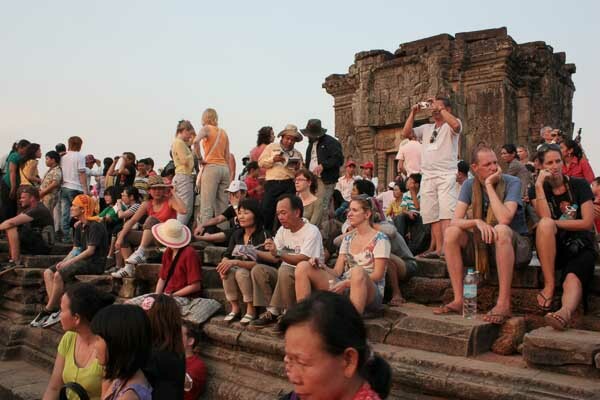 After my first group tour in 2009 I was astonished to find that I like both modes (as long as I’ve picked the right tour to suit my needs for that trip/destination). Bottom Line (for me): Not all tours are created equally. Not all people have the same sense of adventure. Not everyone has the luxury to spend a significant amount of time in any one place. For many, this tour is their trip of a lifetime and they won’t ever return to that destination – therefore, they want to see and experience a lot in the least number of days. I think the fact that they are travelling outside of their own area is fantastic, regardless of how they choose to do it. Hit the nail on the head for me in just one sentence “…that tiny out-of-the-way cafe …” Priceless. I fully agree with you on this! When we were in Miami four years ago, we decided to walk to a shopping mall we wanted to see. It couldn’t be that long of a walk, right?! Turned out it took us about 4 hours to walk there. :P We ended up at a very Spanish café. It was the best experience ever! Everyone speaked only Spanish, we had to point and smile to communicate and it is always this experience that pops up when we talk about our trip to Miami! Great article, but I expect that you’re probably preaching to the choir which is why most people reading this agree with you. The people who do those types of group tours probably aren’t reading these types of travel blogs. Appreciate the comments left by Viv though…gives a different perspective. http://www.travelwithkevinandruth.com recently posted..Do you read the labels? I agree fully! However, lots of people don’t have that luxury of time to travel low and slow like you (and I sure wish I did). Lots of people try to balance travel with a stable job, raising a family, paying a mortgage, and maintaining relationships with friends and family. Kudos to anyone bold enough to take the plunge and become a new nomad, but I myself LIKE having the house, the job, the family, and the social life. I also like to travel, and more often than not, find myself on that tour bus because I just don’t have the time or the means to find my own way and risk getting lost or just going back to my room deflated. One day, I would like to eschew the tour bus and take a month, six months, a year to truly experience a culture other than my own. This blog helps to inspire me! I love the idea of just walking in whatever direction you feel like to explore your surroundings. You see and experience so much more on foot or by bicycle than you ever could driving by in a ar or tour bus. I love to read travel books and got a great book out of the library on ten walking tours of Tokyo. What I got out of that book was that just about any neighborhood you happened to be in would have tons of interesting stuff to see. Could not agree more. When you take tours, you always get scammed. Are you heading towards Costa Rica? We will be staying a few weeks more in Manuel Antonio (hostel.cr). It would be great to see you. I dont play well with other children and have an aversion to be told what to do, when to do it and a problem with mates rates. In saying that, I love the city tour bus which gives you an orientation of a city. Best of all is getting lost in a place. That’s when you get the rap feel. Like your blog posts, i think we are akin. I would always prefer to go on an independent travel than go on an organized tour. It’s rather fun to be more flexible with the schedule since there are times when you don’t have the mood to go to that place or eat that food. It’s best to follow our own schedule, make changes and go with the flow. definitely the only way to travel nothing worse than large groups of people following an umbrella with someone hurrying you through the things you really want to see and letting you stay longer at the places you want to leave. tHe more independent travel we do the more we want to do. I like the idea of just walking off in any direction and discovering things yourself. I once took a trip to Korea, and we were ushered onto the bus after spending very little time in each place…but we were given an unlimited amount of time at some jewelry some market. Review the destination and prepare well before your trip starts. 90% of the fun of traveling is exploring the world on your own agenda…not the pre-set agenda of a for-profit tour guide company. Getting lost is how you get found! Great post, Wes! As a tour provider, I both agree with you and disagree with you. One of the reasons I started my business (providing tours of New York’s Central Park) was because there are so many disingenuous people giving tours. I’m familiar with the package tour machines. I used to work in Las Vegas as a concierge and judge people from behind my desk that bought transportation to and from the Casino that was more expensive than a taxi. I watched in amazement as people went and saw things that were not created for the sake of art but created solely to take their money. When I lived in Los Angeles I watched the packaged tour lemmings being dropped off in front of the Grauman’s Chinese that has become a zoo and doesn’t depict Los Angeles as it is today. In New York, I worked for a tour company that refused to make stops at restaurants unless they got a percentage of the profit (it is illegal for a tour guide to accept kickbacks in NY but tour operators do it all the time). I on the other hand, also judge people who don’t take tours. The other day I saw a woman march into Times Square with her daughter. “Honey, this is Times Square where all of the… you know, you see it on tv. The ball drops here. It’s… well, is that it there? Can we find it? It’s famous.” As much as it is a virtue to go someplace and give yourself time to have spontaneous adventures and meet new people, there’s exists an extreme where people wander aimlessly never learning anything about the culture around them. Not all tour companies are bad. My tour provides everyone who comes on the tour with a free glass of champagne, beer, or wine at a restaurant near the park. I receive no financial compensation from the deal. It’s a nice restaurant with reasonable prices that isn’t overly crowded or I wouldn’t have picked it. The restaurant is happy just to have people wander in. My groups are also not large. I cap them at 16 people. I could make lots of money easily by accepting larger groups. It pains me to tell people I cannot add them to a sold out tour. But, I’ve found 16 is the magic number. Anymore than that, and it loses the feeling of intimacy. I’m also very particular about my guides. I only work with people who are as passionate about the history, the park, and the present city as I am. We’ve taken a number of locals through the park and they walk away having seen things they never saw. It’s their backyard but they take it for granted. There are other tour operators in the city that offer worthwhile experiences too. Sure, it’s not the package folks. But, I know the city of New York better than people who’ve lived there their whole lives. So, after reading this, I agree wholeheartedly with what you say about package deals. But I strongly disagree about tours in general. A good tour should comprehensively focus on a particular area. It shouldn’t seem like someone has put together a list of places that they are going to take you. It should be an experience that teaches you and orients you and exposes you to things. Don’t write the tours off completely. I agree — I wouldn’t write them off entirely. But I’m thinking more of the packaged, multi-day tours where you spend most of your time on a bus or in an over-priced shop… Small tours have a lot to offer, in my opinion. Agreed. Only once in a blue moon do I bother with a tour, and even then its with a super small group doing something that I couldn’t do solo. You lose something when you are mindlessly following someone with a big flag. This is very true, only once have I ever taken a tour and I vowed never to do it again. I feel you never really get the chance to get under the skin of a place, you are forever a passerby, I say get down there and get involved, get lost and find the place for yourself, speak to locals, do your research and you will not be disappointing. Nic Hilditch-Short recently posted..Travel Tattoos. Marking your memories. Great article. It is so much better to explore for yourself and really discover the people and the places that these organised tours skip over in search of the safe and predictable. Roaming Renegades recently posted..Le Tour De France Comes To My Village! !